Neil Robertson won a dramatic final 10-9 against Joe Perry to win the Wuxi Classic in China for the second consecutive year. From 9-8 down, Robertson rose to the occasion with breaks of 87 and 78 to win the last two frames of an exciting contest. His practice partner Perry had been chasing the first ranking title of his career but was denied despite winning three frames in a row from 8-6 down. Robertson showed his ruthless streak on the table at the key moment, but the 32-year-old was in tears afterwards having denied his close friend what would have been his greatest triumph. Melbourne-born Robertson took the £85,000 top prize and the first ranking title of the season, perfect preparation for his home tournament, the Australian Goldfields Open, which starts tomorrow. It’s the tenth ranking title of his career, bringing him level with Jimmy White on the all-time list and behind only Stephen Hendry (36), Steve Davis (28), Ronnie O’Sullivan (26), John Higgins (25), Mark Williams (18) and Ding Junhui (11). Cambridgeshire’s Perry won the first three frames with a top break of 56. Robertson pulled two back before runs of 74 and 61 put Perry 4-2 up. Robertson’s 72 gave him frame seven, and after he lost the eighth, a crucial 31 clearance left the former World Champion just 5-4 behind at the end of the first session. 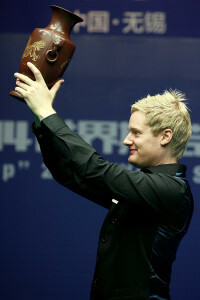 In the concluding session, Robertson won four of the first five frames despite a top break of just 44. Perry, whose only previous ranking final was the 2001 European Open when he lost 9-2 to Stephen Hendry, hit back with three in a row, taking frame 16 on the final black then making a 93 in the 17th to lead 9-8. But Robertson kept his composure and finished in style with two superb breaks. “Joe is one of my best friends on tour and if it wasn’t for him I wouldn’t be here today,” said Robertson. 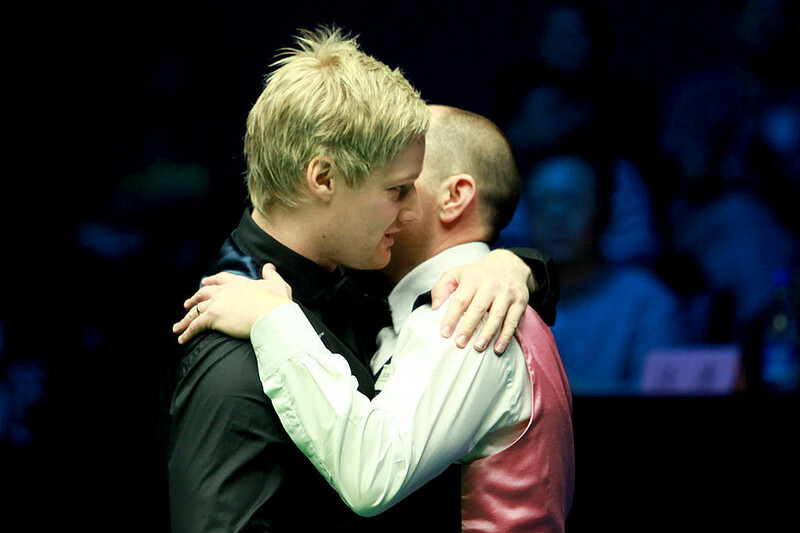 “He has taught me so much about the game and been such a great influence on my career over the past ten years. “The first session today was really tense. At 5-4 down I felt as if I was 6-3 up. The last frame of the first session was huge because Joe should have won it to go 6-3. I just gave it everything I had in the last session and the match got better as it went on. I’m delighted to defend my title here and to start the season in this fashion. It will be a very proud moment for me to go to Australia having won this trophy and it will give next week’s tournament a good boost. Perry said: “I had a chance early in the deciding frame but missed a difficult blue. I made my mind up that if I got a chance I was going to go for it. Neil showed his class. I made a good break to go 9-8 up but then he produced two fantastic breaks under pressure. He showed why he’s probably the best player in the world and one of the hardest to beat. In a few days time I’ll be pleased with what I’ve done this week but at the moment I’m absolutely gutted.